Do you sometimes feel like your life is so busy it’s spiralling out of control? Most of us are juggling work, family, life admin, and multiple other things – adulting is hard work, isn’t it! Because I’m self-employed, I can’t leave my job at the office and often work on my laptop in the evening. This leads to late nights, as I get energised by writing, but that means I can’t sleep. Sleepless night lead to more stress, which means headaches, and that anxious creeping feeling of not being on top of everything. Writing a list can only do so much. So what’s the best way to deal with this? I wish I knew! I’m trying giving myself some TLC. Exercise and drinking more water and less caffeine are often recommended, as is yoga or mindfulness. I’ve got to admit I’ve fallen off the gym wagon over the summer, but now I’m getting back on it! Getting more sleep is top of my list too, and luckily I have some help in that area. 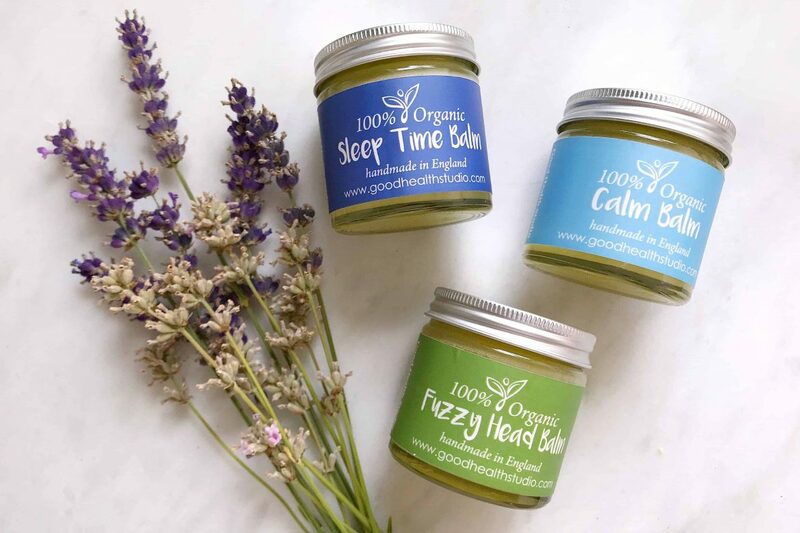 I’ve been sent a selection of 100% organic aromatherapy wellness balms from Good Health Studio to review. They are handmade made by Cecelia Simpson, a very experienced therapist and aromatherapist, who I’ve visited for lots of lovely treatments in the past, including Indian head massage and reflexology. The balm I was most keen to try was the Sleep Time Balm, I couldn’t wait to see if it helped me nod off! 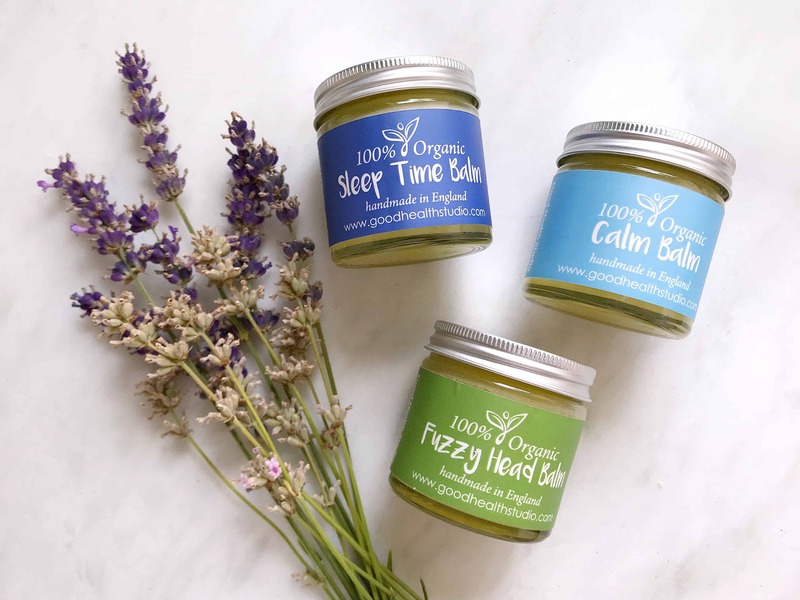 Each of the organic aromatherapy wellness balms is hand made in small batches down the road from me, in Buckinghamshire, England. They’ve been certified by a toxicologist and contain no nasties. They are free from parabens, SLS, mineral oils, artificial fragrances, preservatives, alcohol and not tested on animals. They all smell gorgeous, but not necessarily how you would expect. Whenever I’ve smelled sleep sprays in the past they all smell heavily of lavender, with some chamomile thrown in for good measure. These wellness balms have a much more complex fragrance profile, as they are made with real oils, not synthetic fragrances. Packaged in a jar, made of up to 30% recycled glass, with an aluminium lid. Both jar and lid are recyclable. The organic aromatherapy wellness balms are suitable for children from the age of three. Each of the organic aromatherapy wellness balms have the same base ingredients, of Sunflower Oil, Olive Oil, Beeswax and Jojoba Oil. Then selected fragrance oils are added to provide the aromatherapy effect. 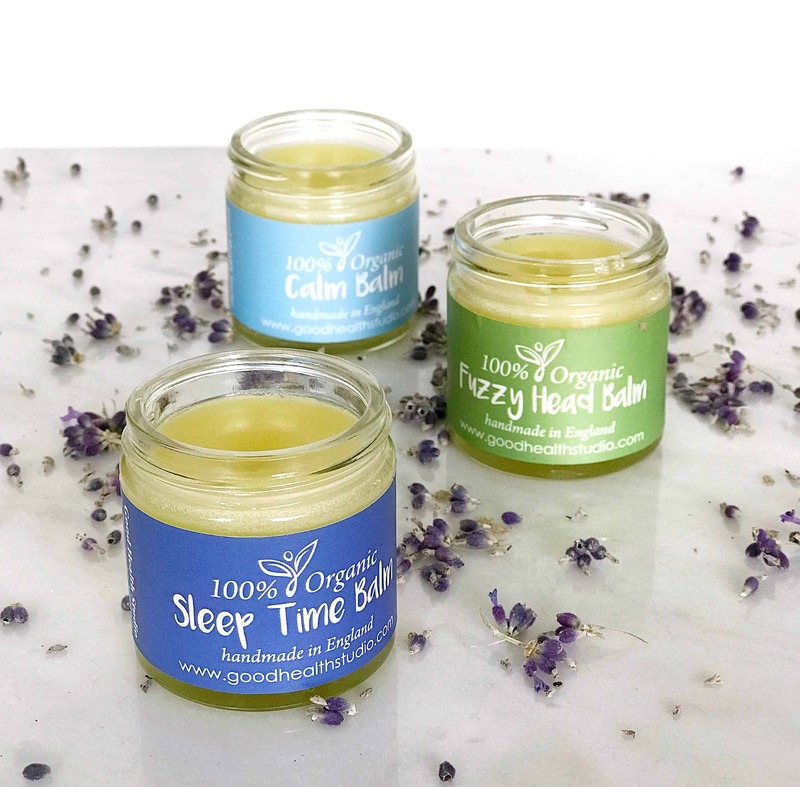 This aromatherapy balm is to promote a good and restful sleep. This aromatherapy balm is to help combat stress, anxiety or panicky feelings. This aromatherapy balm is to help the symptoms of headaches or migraines. 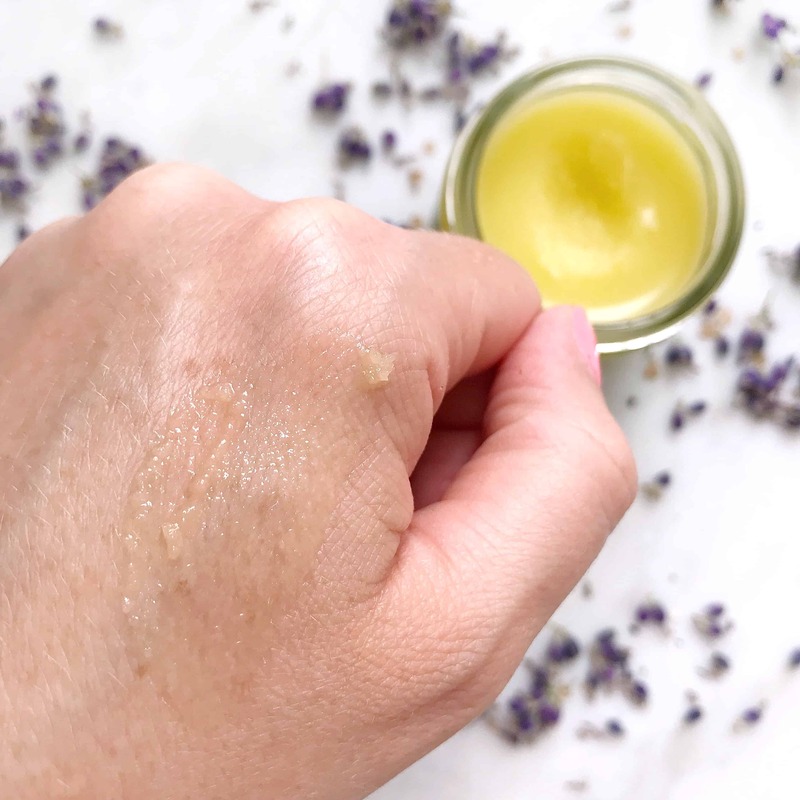 It’s super quick and easy to use the organic aromatherapy wellness balms: just dab a small amount on to pulse points, forehead and chest, and let the lovely fragrance get to work. Because they have a nourishing base of sunflower, olive and jojoba oil, they are lovely and moisturising and melt into the skin. I have been massaging them over my décolletage too, to hopefully stop the skin from drying out. I popped some of the Calm Balm and Sleep Well Balm into a contact lens case so that I could take them with me on my recent trip to Nashville. It was nice to use them on the plane, as they helped to mask the smell of the man sitting next to me! I’ve also been putting a little Calm Balm onto the girl’s wrists if they can’t sleep, but I call it ‘Calm Down Balm’. It’s definitely helping them nod off when they are having trouble relaxing. Do Organic Aromatherapy Wellness Balms Help? The balms all smell lovely, and although they do smell different to each other, it’s pretty subtle. I do think the sleep balm is helping me relax and get to sleep quicker, and that is my favourite of the three. I also like the Calm Balm for those moments when it all gets a bit much. The Fuzzy Head Balm is soothing when you have a headache, and luckily I haven’t had a migraine recently so haven’t tested it on that! Although applying an aromatherapy balm by itself probably won’t make a dramatic effect to your wellbeing, it’s a small step you can easily introduce to your routine. It’s a simple way of nurturing yourself and taking just a few moments to look after your wellbeing. 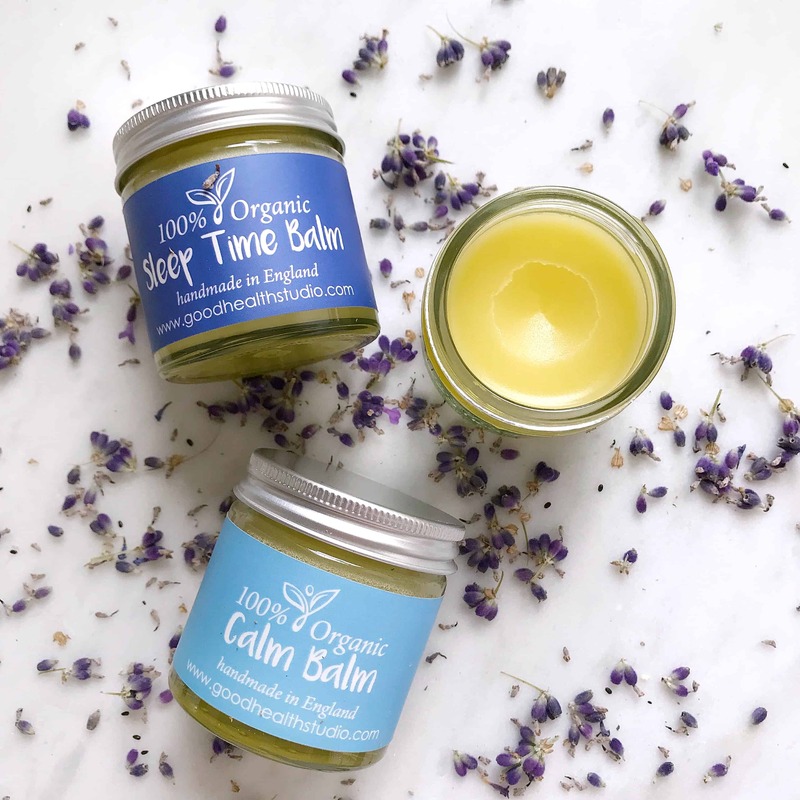 I think combining the use of one or more of these aromatherapy balms will help promote relaxation and sleep, and will continue using them. The balms cost £21.99 for a 50g jar, which will last for ages, even if you use it every day or night. There are also travel tins of 10g for £5.99 which is a great way to try them. 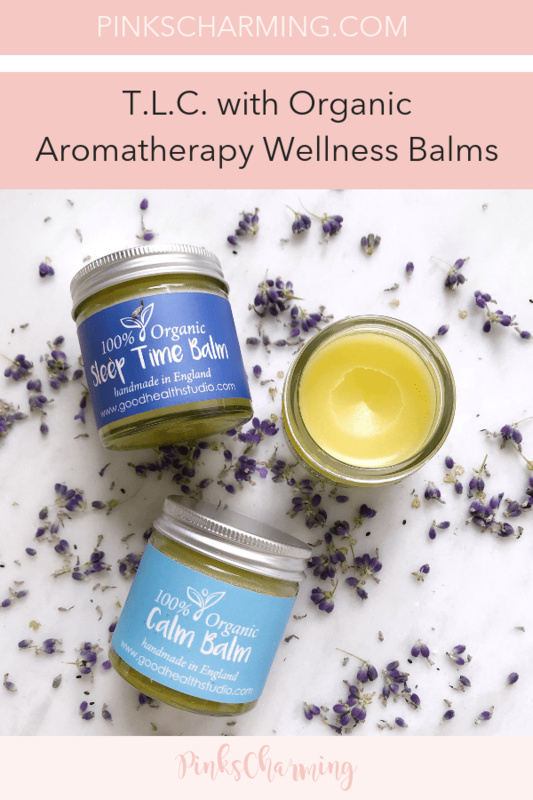 If you have trouble sleeping, or anxiety or headaches, I would say these aromatherapy balms would be worth a try. The beauty of them is they certainly won’t do any harm, and are very pleasant to use. Why not pin this review for later?